A farmer and his wife had a daughter. The daughter was being courted by a handsome young man. On the night when the young man came to ask for the daughter's hand in marriage, something very silly happened. The daughter was sent to the cellar to fill a pitcher with ale to drink. As she looked up, she saw an axe stuck in one of the beams. Suddenly she thought, "Oh, NO! What if he and I are to be married? What if we have a son? What if he grows up to be a fine young man? What if he was to come down to the cellar to pour some ale and the axe falls down and kills him? How sad that would be!" She sat down on the floor and began crying. As she cried, the ale poured all over the floor. Soon the mother went down to the cellar to see what was taking so long, She saw her daughter and asked, "Why are you crying?" Her daughter said, "Look up! Do you see that axe? What if he and I are to be married? What is we have a son? What if he grows up to be a fine young man? And what if he was to come down to the cellar to pour some ale and the axe falls down and kills him? Oh how sad that would be!" When the mother heard that, she also began to cry! "Oh no, how sad that would be!" Soon the father went down to the cellar to see what was taking so long. He saw his wife and daughter and asked, "Why are you crying?" His wife said, "Look up! Do you see that axe? What if he and our daughter are to be married? What if they have a son? What if he grows up to be a fine young man? And what if he was to come down to the cellar to pour some ale and the axe falls down and kills him? How sad that would be!" When the father heard that he also began to cry! "Oh, no, how sad that would be!" Finally, the young man went down to the cellar to see what was taking so long. He saw the father, the mother and the daughter and asked, "Why are you crying?" The father said, "Look up! Do you see that axe? What if you and she are to be married? What if you have a son? What if he grows up to be a fine young man? And what if he was to come down to the cellar to pour some ale and the axe falls down and kills him? Oh, how sad that would be!" When the young man heard that, he walked over and took down the axe and handed it to the father. "I have traveled to many places, but I have never heard of anything so silly. I am leaving, and ONLY if I ever find three people who are silly as you will I come back to marry your daughter." He set out on his horse and traveled a long way. As he stopped to rest he saw a woman trying to push a cow up a ladder that was against the side of her house. "What are you doing?" the young man asked. "The grass on my roof has grown too long. I am taking the cow up on the roof to eat the grass." "Why don't you cut the grass and toss it down to the cow?" he suggested. But, the woman did not listen. She pushed the cow up the ladder, tied a rope to its neck, tossed the rope down the chimney and went inside to tie it to her wrist in case the cow got too close to the edge of the roof. Just as the young man started to ride away, the cow stepped off the edge of the roof and mooed loudly. The rope pulled the screaming woman up the chimney. Neighbors ran to help her as the young man rode off thinking, "That is one silly person!" He rode until night and stopped at an inn to sleep. He woke to a strange sound in the room next to his in the morning. "Step, step, step, Bam! OWWWW! Step, step, step, Bam! OWWWW!" He knocked, then carefully opened the door and saw a stranger running across the room, "Step, step, step." He watched the man run to where his pants hung on the closet door and leap into the air and, "Bam!" The man ran into the closet door and yelled, "OWWWW!" "What are you doing," the young man asked? "I am putting on my pants, and it hurts a lot. It is painful getting dressed in the morning!" "Why don't you sit on the bed and put your pants on one leg at a time?" laughed the young man. "I had never thought of that." said the stranger. "Thank you!" "That's two silly people," said the young man, as he rode away. That evening he saw villagers running. They were carrying rakes and brooms and pitchforks. "What is happening?" he asked. Someone shouted, "The moon has fallen into the pond. We are running to get it out!" The young man laughed and told them to look into the sky. The moon in the pond is only a reflection of the real moon. 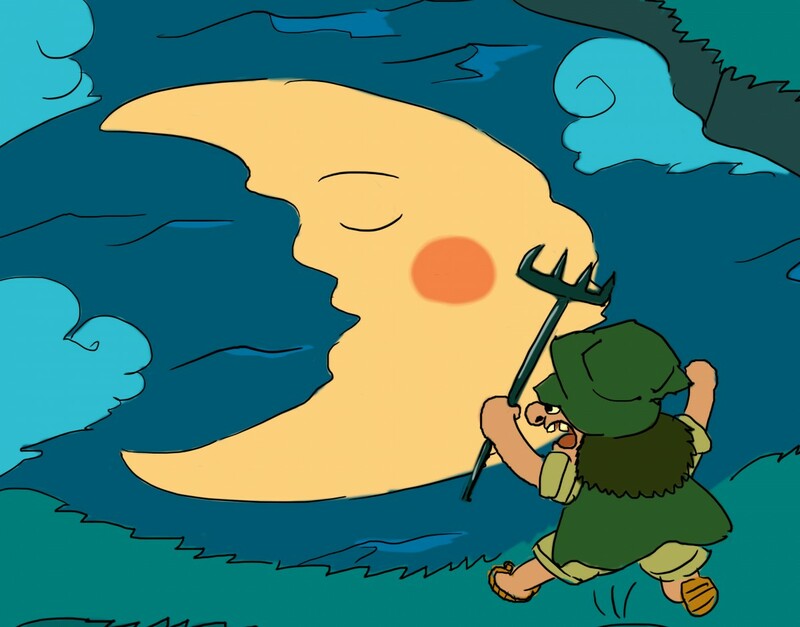 But they refused to listen and kept trying to get the moon out of the pond. "That makes more than three silly people," he said. "I think I will go back to my own three sillies so we can all live HAPPILY EVER AFTER!"